. : FAQ :: How it Works :: Presentations :: Publications :: Posters :: Press :: Acknowledgements :. Standard vehicle headlights improve driver visibility at night by illuminating the road and the surrounding environment. 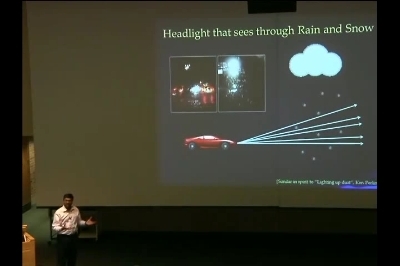 Unfortunately, they also illuminate raindrops and snowflakes making them appear as bright flickering streaks that are distracting to the driver. 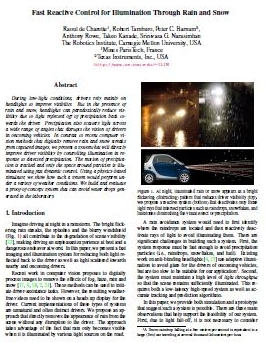 We propose a headlight capable of avoiding precipitation to improve driver visibility while adequately illuminating the road. This reduces driver stress and makes roads more safe during rain and snow storms. 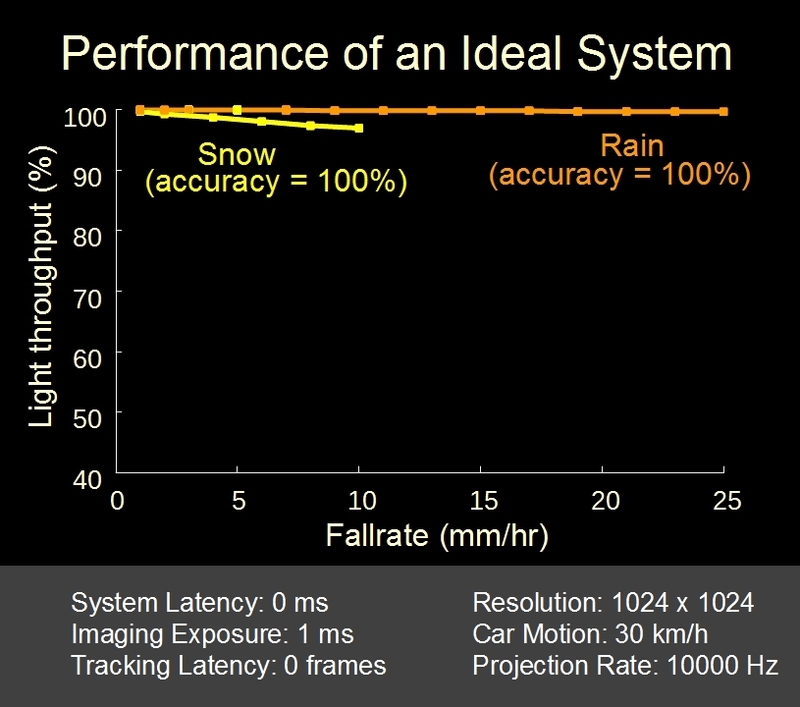 We have conducted simulations and built a prototype system to show that the approach is feasible and effective. 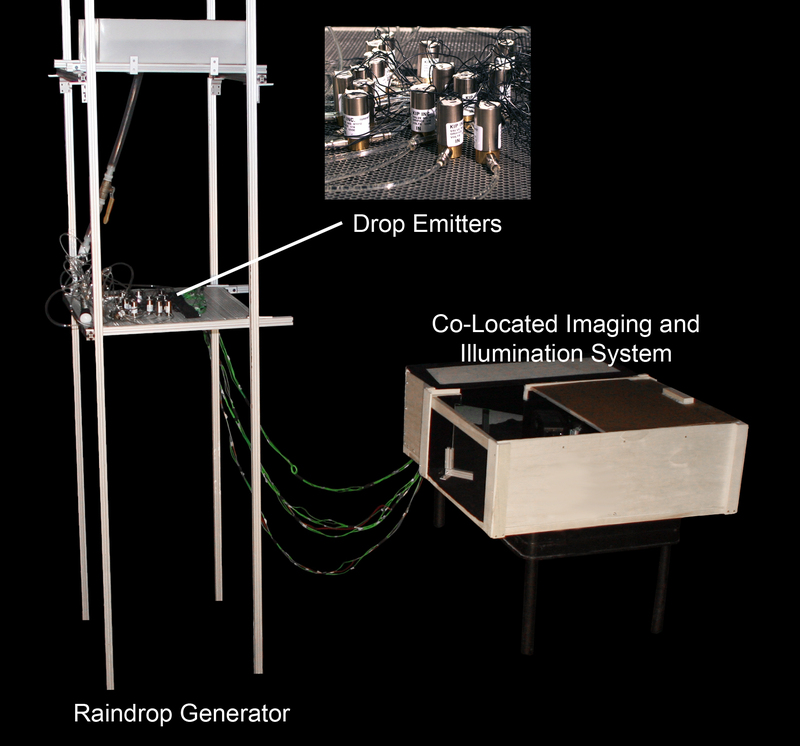 Demonstration of the prototype system with an artificial rain drop generator is encouraging making the falling rain disappear in front of the observer. Media requests: Please read the FAQ first. 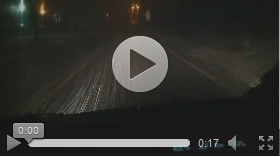 Distracting snow streaks while driving with high and low beams (download video). 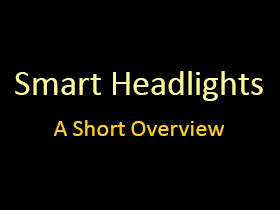 Overview of Smart Headlight project. 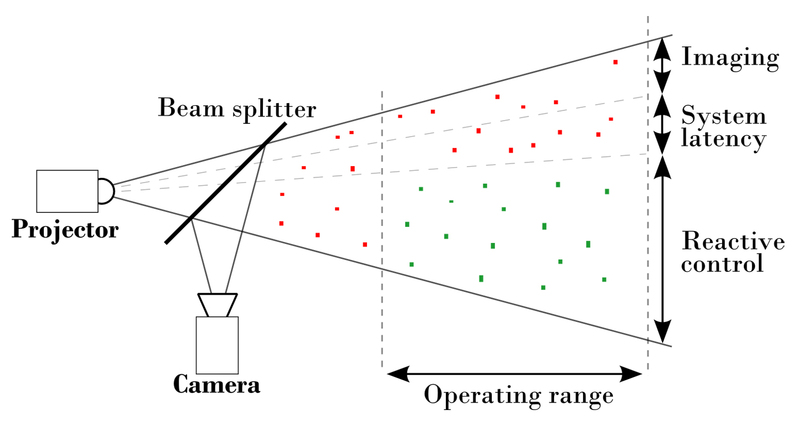 Overall Approach: The headlight is a co-located imaging and illumination system consisting of a projector, camera, and 50/50 beamsplitter. 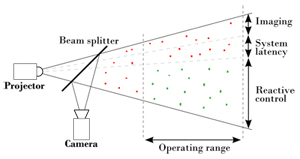 The camera images the precipitation at the top of the field of view, the processor determines the future locations of the particles and the projector reacts to dis-illuminate the particles. 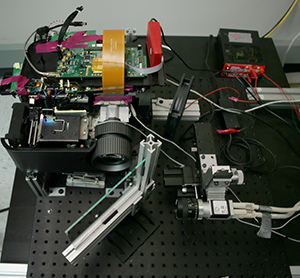 The entire process from capture to reaction takes about 13 ms.
Prototype System: Components of our prototype co-located imaging and illumination system. 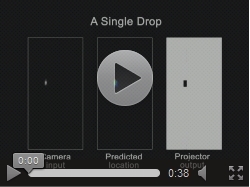 Detecting, predicting and tracking drops: The video on the left showcases our algorithm first acting on a single drop and then on 16 falling drops per second (download video). 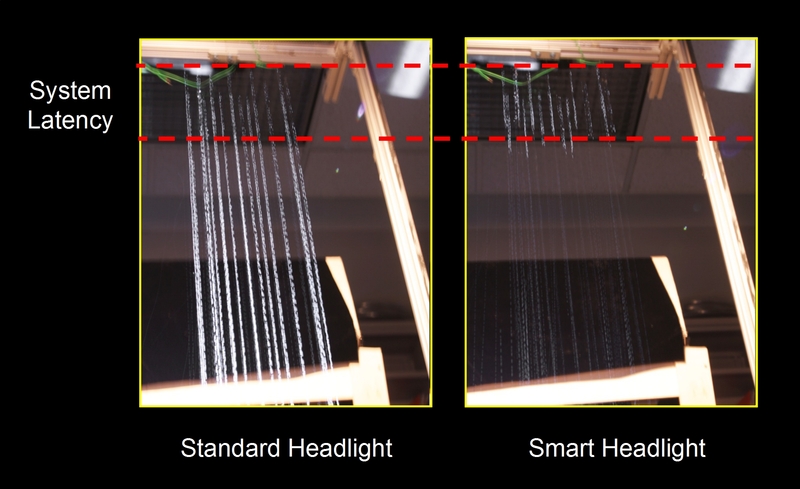 System at Work: Naive illumination on left and fast reactive illumination on right during equivalent of heavy rainfall. Photos captured with long exposure time (2.5s). 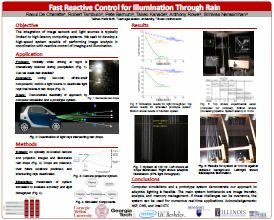 Making Rain Disappear: Increasing observer visibility by successfully deactivating light rays intersecting generated drops (download video). 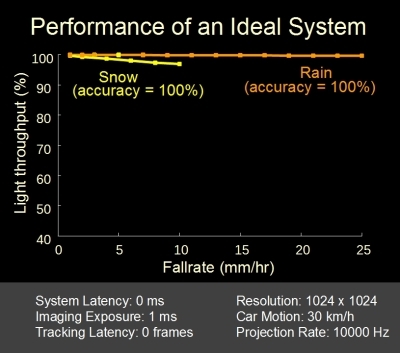 Particles System Simulator: Simulator emulates properties of rain, snow, and hail, in addition to the properties of a camera, projector, and processor to measure system performance. 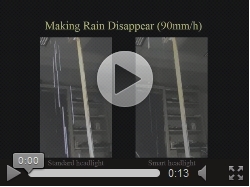 Left video shows simulation with moderate rain with vehicle stationary and in motion (download video). Simulation Results: Plots of simulation results with parameters of our prototype system (left) and an ideal system (right). 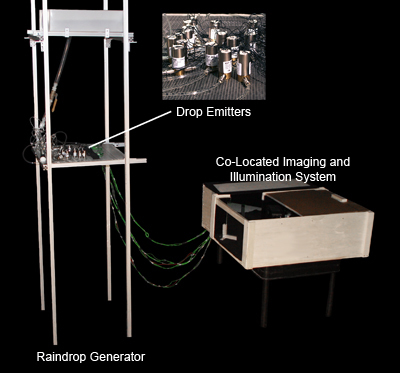 Raindrop Generator: Artificial raindrop generator shown with co-location system. 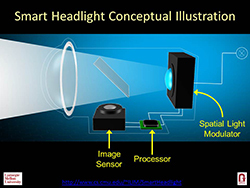 The Future: Concept illustration of prototype design scaled for implementation in an automotive headlight (download video). 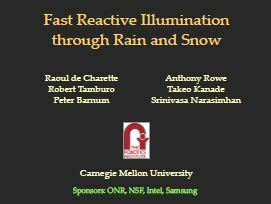 "Fast Reactive Control for Illumination through Rain and Snow"
Raoul de Charette, Robert Tamburo, Peter Barnum, Anthony Rowe, Takeo Kanade and Srinivasa G. Narasimhan, Presented at 3rd Workshop on SoCs, Heterogeneous Architectures and Workloads at the 18th International Symposium on High Performance Computer Architecture, New Orleans, LA, Feb 2012. 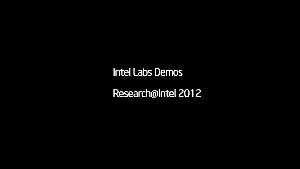 There was considerable media coverage for a year starting in the Summer of 2012 following a demonstration at Research@Intel 2012, and a Carnegie Mellon University homepage feature and press release. 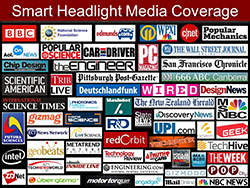 Coverage took many forms from radio, television, magazine print, internet articles, blogs, and YouTube videos. 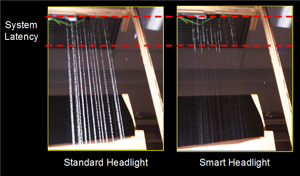 Our smart headlights were featured as a "Top Ten Most Promising Technologies" [Car and Driver, December 2012] and "Six new car technologies that will simplify your life" [Edmunds, June 2013]. 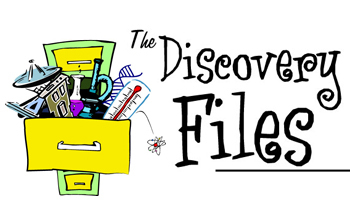 The PDF file to the right contains clickable logos to the published stories. Below are some video/audio files. This research was supported in parts by an ONR grant N00014-11-1-0295, an NSF CAREER award IIS-0643628 and a Carnegie Mellon University Transportation Center grant. Robert Tamburo is supported by an Intel Science and Technology Center-Embedded Computing grant. Narasimhan was partly supported by a Samsung Advanced Institute of Technology grant. 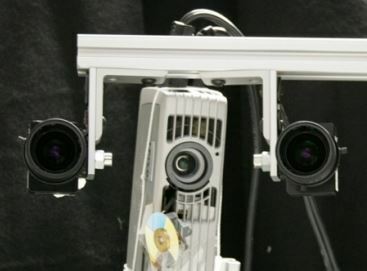 The smart headlight was born as a stereoscopic system consisting of two monochrome cameras and a DLP projector. 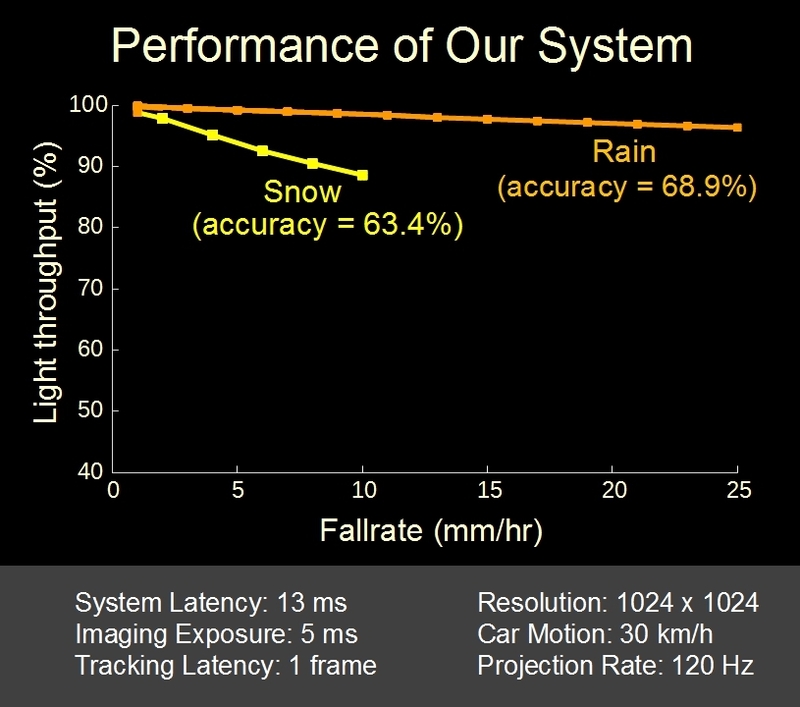 The camera /projector speed was 60 Hz and the system had a latency of 70 ms. The current system on this webpage. A beam splitter was used to optically co-locate a monochrome camera with a DLP projector. 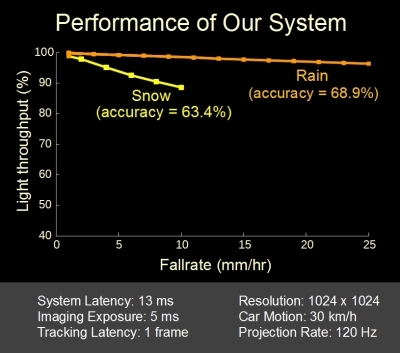 System speed was increased to 120 Hz and latency was reduced to 13 ms. The system currently under development has a similar setup as this system. 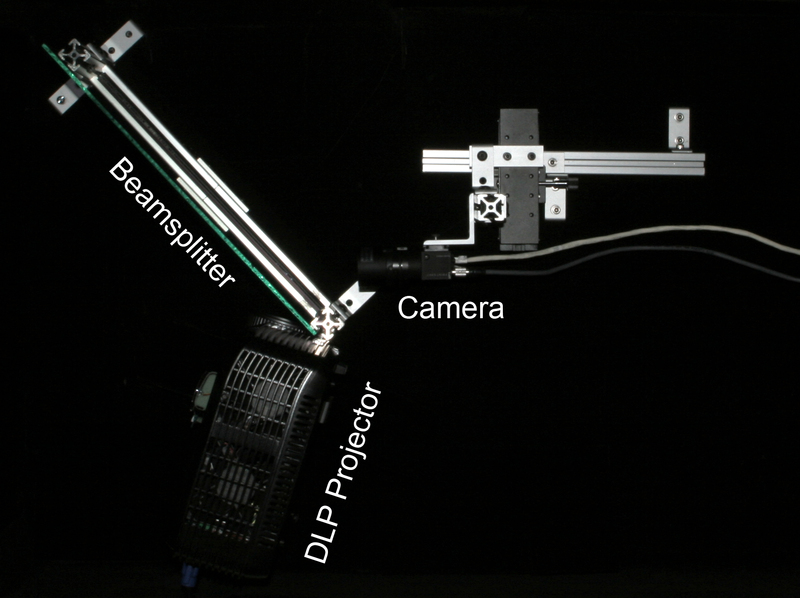 The camera and projector hardware was upgraded for speeds near 1000 Hz and latency approaching 1 ms. Click here.